Reed’s ball rolled down the steep bank of the hazard and came to rest in an unplayable position, so what were his options under the Rules? He only had two options left: return to where he last played from to drop a ball under penalty of stroke and distance; or drop a ball behind the water hazard, keeping the point at which the original ball last crossed the margin of the water hazard directly between the hole and the spot on which the ball is dropped, with no limit to how far behind the water hazard the ball may be dropped. • The line of flight of the ball from where the stroke was made is not relevant. 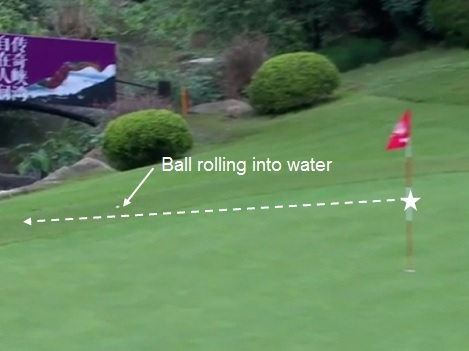 • The reference point for the drop is where the ball last crossed the hazard, which in this incident was the putting green side of the water hazard. • The ball may be dropped anywhere on the course on an extension of the line from the flagstick through where the ball last crossed the margin. This will always be on the far side of the hazard from the hole and the ball may be dropped in a bunker or another water hazard. I have been asked what the situation is if a player who thinks that they cannot reach the fairway on the far side of a water hazard from the teeing ground takes their ball straight to a dropping zone. The player would be disqualified under Rule 11-4b, for playing a ball from outside the teeing ground and not subsequently correcting their mistake before teeing off at the next teeing ground. Q. The design of a hole is such that a player must hit the ball about 100 yards in order to carry a water hazard. A Local Rule has been adopted to assist players who cannot drive over the hazard by allowing them to drop a ball, under penalty of two strokes, in a dropping zone that is located across the hazard. Is such a Local Rule authorized? A. No. Such a Local Rule substantially alters Rule 26-1b as it allows the player to drop a ball on a part of the course (i.e., on the green side of the water hazard) that the Rule would not have permitted him to reach. Furthermore, the penalty for taking relief under the water hazard Rule (Rule 26) is one stroke, and may not be increased to two strokes by a Committee through a Local Rule - see Rule 33-8b. I have heard several myths about what a player may borrow from a fellow competitor during their round. Balls (but if a One Ball Condition is in effect, the player would need to borrow the same brand and type of ball that they had been using). Equipment (e.g. tee, towel, ball marker, pitch repairer, trolley and umbrella). Clothing (e.g. rain gear, sweater and glove). Any club selected for play by any other person playing on the course, Rule 4-4a. However, a player may borrow a club for measuring purposes, providing they do not borrow and measure with a club that is longer than one that they carry in their own bag. They may also borrow a club to practice putts or chips between holes, as permitted by Rule 7-2, providing the club is not used to make a stroke that counts in the player's score. The penalty for a breach of Rule 4-4a in stroke play is two strokes for each hole at which any breach occurred, with a maximum penalty of four strokes (two strokes at each of the first two holes at which any breach occurred). The penalty in match play, at the conclusion of the hole at which the breach is discovered, is that the state of the match is adjusted by deducting one hole for each hole at which a breach occurred, with a maximum deduction of two holes. Please remember that you can choose to receive my two-weekly blogs by email by subscribing at the top right corner of any of my blog pages. You can also start receiving my weekly ‘Rhodes Rules School’ series emails at this link. When you subscribe you will also receive a complimentary quiz on the Rules containing 27 questions, with answers and references. There is no charge for either of these services and you may unsubscribe at any time. Just a question on your response to "Dropping Zone for Short Hitters" on 11/2. Assume I have a 19 handicap for that course. I can only hit my drive 90 yards in the air so I'll never clear the water hazard. Let me know if my understanding is correct for: (A) in a non-tournament round I keep trying to hit balls until my score for the hole is 7 (max i can take on a hole) and then move on to the next tee? (B) in a tournament round, I keep hitting balls until I run out of balls (if i have 50 balls, this will take a while) and then withdraw? Thanks. Jerry K.
Correct, except in (B)that you would probably be disqualified for undue delay of play before you ran out of balls! Back to the driving range/Pro to increase your distance of the tee! Sharing clubs in a round. Can you not share a club with your playing partner so long as your total clubs don't come to more than 14 between you? Yes you can. But that has nothing to do with borrowing a club from a fellow competitor, which was the subject!